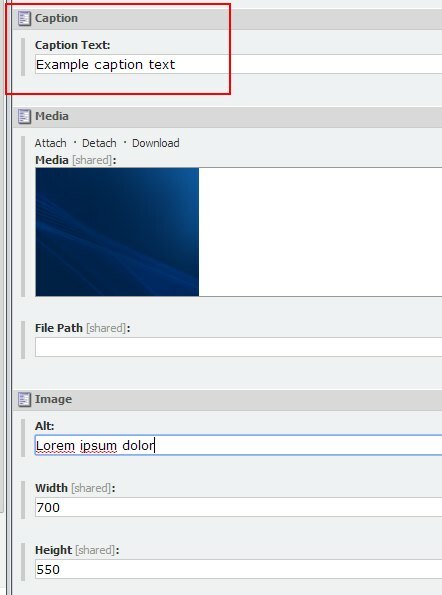 The Problem: Sitecore does not provide an out of the box solution for adding captions to images in rich-text editor fields. This is a must have feature and something that users expect to find in Sitecore. My Solution: I ended up adding a pipeline that parses through the HTML content held in rich-text fields and adds captions when it finds appropriate images. So the caption is added when a page is rendered at run time. This solution holds the caption text in a field that is actually on the media item itself. It’s debatable if this is the best place to hold the caption text but I like the idea of entering a caption on the Sitecore media item and having it be reused each time the image is displayed in a rich-text field. As you can see in the image above, I added a Caption Text field to the image templates. You can add this field directly to the JPEG and Image templates but you need to consider that the templates will be reset when upgrading to a new version of Sitecore. Your best bet is to create your own custom image templates that inherit from the default JPEG and Image templates. This topic is discussed in a supplemental blog post named Custom Image Templates in Sitecore. Of course you could always choose a pre-existing field like the Description field to be the “caption” field. Just make sure that the field you choose exists on both the JPEG and Image templates. You can change the “caption” field by making a change to the custom config file outlined at the bottom of the post. In a perfect world you would be able to right click on an image in a rich-text field and also be able to enter the caption as an image property but I don’t know how to do that at the moment (Any advice would be appreciated). The solution feels a little hacky but there are lots of various scenarios to account for in the code. For instance the image can be floated left, floated right, can be linked, can have its height and width changed, etc. That’s probably why the code started to get a bit long. ///     field to pull the caption from in the setRteCaptions.config file. /// Gets the width of the image wrapper. /// Determines whether [is valid integer] [the specified width]. Let me know what you think and what you’re currently using for image captions in rich-text fields. great article on how to add image captions. unfortunately we can’t make use of “renderfield” because our project is based on MVC. Would you know of a workaround?